Now that the latest Shuttle mission is over, I can get back to work. I follow the missions pretty closely on NASA TV via their website. 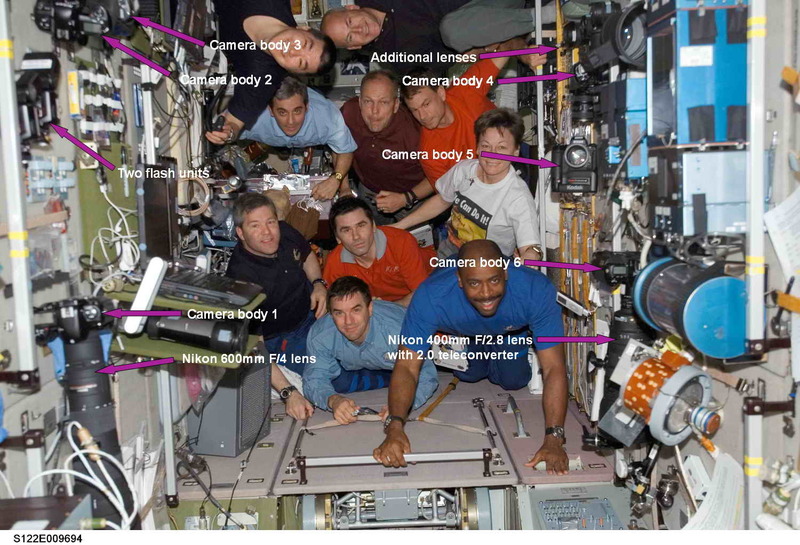 If you're wondering about what kind of camera equipment they have on board the ISS, the picture below will give you a good idea. It's been resized for quick viewing, if you want the original, go here. I've pointed out the lenses and camera bodies, which appear to be all Nikon. I've never seen any other brand for still photography, though they have at least two Sony video cams I think, and a HD cam somewhere, as they're shooting HD on the ISS, check out the pretty good "life in orbit" video. The image reveals six camera bodies and of course the one that captured this photo, plus two very expensive super telephoto lenses. One looks to be a Nikon 600mm F/4, the other a Nikon 400mm F/2.8 with a 2.0 TC attached, and an unknown focal length telephoto lens in the upper right side on the wall by all the other lenses. I believe they also have at least two more cameras for EVAs, white-wrapped for use outside, but it could be they use a normal one and use the wrap for the EVA. This image was taken in the Russian Zvezda service module, where they also eat dinner; see dining table on the left side middle, under the Frenchmen with the denim looking shirt. 159kb file, so click me for larger version. This is the STS-122 crew, together with the ISS Expedition 16 crew. Rain, clouds and mucho hiking the past couple of weeks, and in-between I've managed to test my lens collection for auto-focus performance on the Sony A 700. Although I haven't tested the A 200 or A 300 series bodies, I can tell you the A 700 is substantially better in both speed and accuracy as compared to the A 100. Also, I've been reading the reviews of the A 200, and it seems this body is better than the A 100 for focusing too, but not quite as good as the A 700. It appears if you want a legitimate upgrade to your A 100, you might have to go with the A 700, the reason I say this is, with the A 200 you don't get a direct manual focus mode (which is very handy for some Sony lenses or aftermarket lenses) or DOF preview button (which I use for display shots or macros) and finally, no mirror lock up with the 2 second timer, again, handy for super telephoto and/or a tripod that's over-extended. I have some updates on the A 700 review page concerning D-Range Optimizer and Creative style comparisons. Go here to see the updates at the bottom of the page. Also, since the auto-focusing performance is better on the A 700, I'm going to update my lens reviews to indicate this, which will vindicate Sony to some extent; eh, maybe I've been a little hard on 'em. Wow! I'm sure glad that hectic PMA week is over, with all the camera reviews I had to do. OK, so maybe I wasn't all that busy. I did manage to post the new hike I had listed for a month now but kept the page locked. There're 35 pictures on one page so 56k people please be patient. Go here to check it out. This time it's the very peculiar Table mountain. Also, I've posted a few random shots from the last month or so. Among the 10 shots are 3 of a good-sized cat, taken through my picture window with the A 700 and Sony 18-250mm lens. Click here for an odds and ends picture gallery.